Solid vinyl tile floors make a top-of-the-line choice for almost any room because they are durable, easy to install, impervious to many stains, and easy to maintain. Solid vinyl tiles wear layer go through to the back, so patterns wear longer. The designs and patterns today mimic with uncanny accuracy the natural look of granite, limestone, marble and wood. 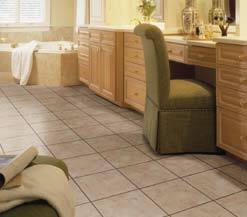 High quality solid vinyl tile flooring is more expensive, but longer lasting than composition vinyl tile flooring. No matter what your particular tastes are regarding design and color, you will be pleasantly surprised at the many choices that are available. Regarding installation, make sure that the installer is qualified to deal with any sub-floor irregularities that would otherwise effect how the finished product turns out. Floating and patching may be necessary to ensure the surface is smooth and flat so the flooring will look that way also. Care and maintenance recommended by the manufacturer should be followed completely. This way, there will be no questions if a warranty issue arises. They will only fully back the product if their guidelines were followed. It is a good idea to have a small piece leftover from the job in the event down the road a repair has to be made to an area. Keep it in a safe place just in case. A qualified installer will know precisely how to cookie cut the bad spot out and replace it with the piece you saved. If done properly, you will be hard-pressed to see where he worked his magic. For more information on this and other synthetic tile flooring products... FloorBiz is your starting point to all the important solid vinyl tile flooring sites on the internet.